3DLES is consortium partner of the European TILA project, which aim is to improving the quality of foreign language teaching and learning processes by means of meaningful telecollaboration among peers: that is the aim of the European project Telecollaboration for Intercultural Language Acquisition (TILA). The project is funded by the European Commission within the Lifelong Learning Programme and has run from January 2013 to june 2015. 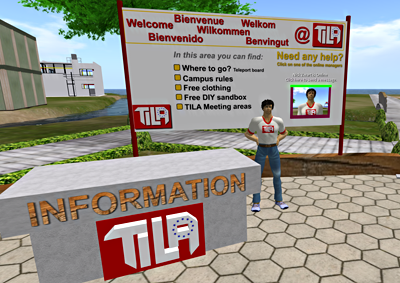 The TILA project has it's own website where you can find all information on how to use the TILA environment in your classroom. Consortium partners: Utrecht University, Berlage Lyceum (Amsterdam) & 3DLES (The Netherlands); University of Roehampton & The Godolphin & Latymer School (UK); Steinbeis Transfer Center Language Learning Media & Gymnasium Saarburg (Germany); Universidad de Valencia & IES Clot del Moro (Spain); Université de Paris 3 & Collège La Cerisaie (France) & Palacky University (Czech Republic). Associate partners: 42 institutions from the Netherlands, UK, Germany, France, Spain, Poland, Portugal and Italy.